The Carter Hart Era has officially begun. The most important person in the Flyers organization is not the new general manager Chuck Fletcher. It’s not captain Claude Giroux, and it’s certainly not interim coach Scott Gordon, or whoever is behind the team’s bench beyond this season. The most important person in the Flyers organization is a 20-year old kid from Alberta named Carter Hart, who has quickly been summoned from the AHL to get his first taste of the National Hockey League. It is rare for a team to entrust such a young talent with the responsibility of tending in the NHL, but these are strange days indeed for the orange and black. Through a couple of generations, the Flyers have been a graveyard for goalies. A loyal fan base has literally watched 57 varieties of goalies over the years, and suffered through the likes of the likes of Roman Chechmanek, Ilya Bryzgalov, Michael Leighton, Petr Mrazek and on and one and on. There have been some bright spots, but those were many seasons in the past, and the recent history is littered with sub-par par and injury. For all the wrong reasons, the Flyers have become a focal point of the NHL this season, firing general manager Ron Hextall, and mercifully finally dispatching coach Dave Hakstol of Monday. Hextall was sent packing for his refusal to quicken the pace of rebuilding, while Hakstol fired the result of team disintegrating before the eyes of a vanishing fan base. Hextall made a massive mistake when he decided to enter this season with goalie Brian Elliott and Michal Neuvirth. Elliott was coming off core muscle surgery, and the guess here is that the injury will haunt him throughout the remainder of his career. Hextall also decided to bring back Neuvirth who is the goalie version of a “check engine” light – he rarely has a long stretch of good health. The result was a disaster in goal as the Flyers continued to be among the NHL’s worst in terms of goaltending. By December, the Flyers had used give goalies, including injury prone Anthony Stolarz, who is once again hurt. As if the goaltending wasn’t bad enough, the Flyers suffered both long and short-term setbacks as Ivan Provorov has inexplicably regressed as has Shayne Gostisbehere and second year second-overall draft pick Nolan Patrick. If you really want to look at a reason why Hakstol had to go it would be the lack of progress from the young players. The idea presented when Hakstol was hired included a belief that he could develop young players, which is why Hextall took a chance on hiring a coach right out of the University of North Dakota. The results are not what was expected, and there should be a real worry that the cupboard that was supposed to be so full of prospects, might be full of “maybe” prospects. The Flyers also fell into a spiral because of special teams, a situation that has turned into a disaster from both the penalty killing and power play. The regression of Gostisbehere and Provorov has been a crucial factor in the demise of a power play that should be far better. All of these elements are true, and it is also true that Hakstol’s coaching was becoming less and less effective as the Flyers fell apart on their road trip through Alberta and then Vancouver. The team lacked both the direction and intensity required to win, and the coach had to be removed. However, for those who want to see a picture of a better future, all eyes have to be trained on the goaltending situation. There is no more hiding from an issue that has haunted the Flyers through what seems like decades. No matter what level of hockey, a team has little to no chance of winning with subpar goaltending. This has not been a matter of superior goaltending, this has been a matter of goaltending that has just not been up to NHL standards of better-than-average, or just over a long period of time. Not since Eric Lindros has a player arrived in Philadelphia with higher hopes from the fan base. This will be a lot different from Lindros for many reasons, not the least of which is that the learning curve for a goalie is far greater than a forward, as there are many stories of forwards arriving and having a major impact. That list is far shorter when you consider defensemen, and almost non-existent when you check out young goalies. Hart arrives with both potential and credentials. Hockey players are pushed through the grinder of worldwide top-level competition from a very early age, and Hart has passed those tests while carrying the hopes of Canadian teams though the years, and earning his stripes in Junior hockey. Hart had a slow start in the AHL, but has recently brought his game to a much higher level. More than anything else, that slow start was not nearly as important as his ability to get past that and elevate his game. No doubt many will be worried that bringing Hart into the NHL at this point is risky business, but the Flyers are at a dangerous crossroads. The Flyers have not delivered the expected improvement, and from both within the organization and within the base of fans, there needs to be some indication that the future will be better. 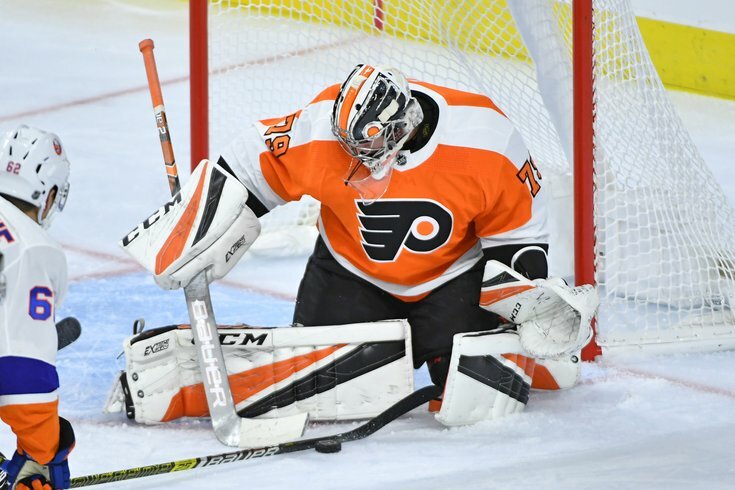 The Flyers do not have a comfort zone, and even if it would have been more comfortable to let Hart get seasoned in the AHL, there is no downside in getting a look at him in the NHL. It might be uncomfortable for awhile, but assuming the goalie is mentally tough enough to deal with some tough times, there is no reason not to get a jump on a better future right now.